New design small inflatable wedge makes it even easier to apply. Used to enter many varieties of automobiles by wedging open the door and unlocking from the inside. 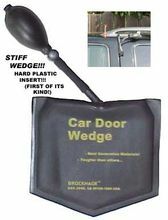 Includes the Brockhage air wedge (small) that will open the gap. This product is the inflatable wedge only.